Get your tomatoes, fruits and vegetables off to a healthy start with Miracle-Gro<sup></sup> Shake n Feed<sup></sup> Tomato, Fruits & Vegetables slow release plant food. This dual-action plant food formula provides continuous release feeding for up to 4 months. The calcium content helps form stronger cell walls for better quality, longer-lasting produce. Plus, it helps prevents blossom-end rot, bitter pit and fruit cracking. This format is perfect for small gardens, making it ideal for the urban dweller. Wont burn your plants  we guarantee it! Feeds up to 2.8 sq. m.
Miracle-Gro Flower Magic is the easiest and most convenient way to grow a beautiful garden. This unique 3-in-1 mix includes premium annual flower seeds, Miracle-Gro plant food, and coir compost that helps to absorb water and protect the seeds. Flower Magic Multicolour Mix includes up to 29 different seed varieties that will bloom throughout the season. Simply shake it on, water, and after 6 weeks you will enjoy beautiful flowers all summer long! Miracle-Gro Flower Magic is the easiest and most convenient way to grow a beautiful garden. This unique 3-in-1 mix includes premium annual flower seeds, Miracle-Gro plant food, and coir compost that helps to absorb water and protect the seeds. Flower Magic Pink & White Mix includes up to 16 different seed varieties that will bloom throughout the season. Simply shake it on, water, and after 6 weeks you will enjoy beautiful flowers all summer long! Miracle-Gro All Purpose Indoor Plant Food 1-1-1 is an easy to apply foam with a pump applicator. The formula promotes lush, healthy-looking foliage on all types of indoor houseplants. The plant food foam lets you know the product has been applied, and will then dissolve into the soil after a few minutes. This plant food should be applied once a week with regular watering. Miracle-Gro Leaf Shine cleans and highlights the natural beauty of all hard leafed foliage plants, such as Ficus, Ivy, Peace Lily and many others. Using the easy-to-use applicator, simply spray the top side of leaves and repeat as desired or when plant leaves appear spotty or dull. Miracle-Gro Leaf Shine is a neem oil free formula, will not clog leaf pores, and is odour-free. 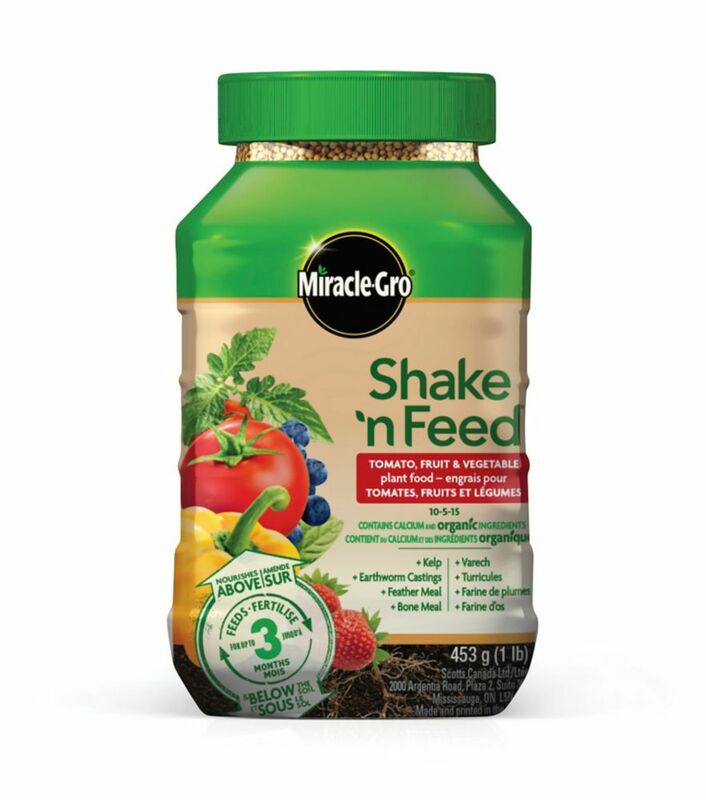 Miracle-Gro Shake 'n Feed Tomato, Fruits & Vegetables 9-4-12 454 g Get your tomatoes, fruits and vegetables off to a healthy start with Miracle-Gro<sup></sup> Shake n Feed<sup></sup> Tomato, Fruits & Vegetables slow release plant food. This dual-action plant food formula provides continuous release feeding for up to 4 months. The calcium content helps form stronger cell walls for better quality, longer-lasting produce. Plus, it helps prevents blossom-end rot, bitter pit and fruit cracking. This format is perfect for small gardens, making it ideal for the urban dweller.